EASYMOD® AF-180P SERIES is a 180 Watt AC-DC Power Supplies platform with both standard and configurable models featuring output voltage(s) that can be quickly configured to order while maintaining all international safety approvals. These 180 watt AC-DC power supplies are available in single, dual, triple or quad output configurations with outputs ranging from 1.5 to 48 VDC. The AF-180P feature an industry-standard footprint; universal AC input; international safety approvals; Class B emissions; and -20°C to +70°C operation. EASYMOD® 180 watt AC-DC power supplies capabilities include a multitude of output voltage configurations, optional covers (with or without fan), extended temperature operating range, isolated outputs, attached wire harnesses and much, much more. All these modifications are available without any impact on safety approvals to reduce both development cost and time to market. Ripple / Noise, max. 1% pk-pk max. V2 - V4: Change in V1 @75 ±25% F/L: ±5% max. Overshoot (all outputs) 10% max. The EASYMOD® family of switched mode AC-DC power supplies has been designed with two precepts; (1) the laws of physics are immutable, and (2) the satisfaction of customer requirements and needs is paramount. A host of modifications, only some of which are listed below, can and will be performed on products for customer programs requiring as few as 250 units per year. These “mods” are available at nominal premium (if any), normally without non-recurring engineering costs (although a one time documentation fee may be incurred), and usually with all safety agency approvals in place. This minimizes both product development cost and new product time to market. 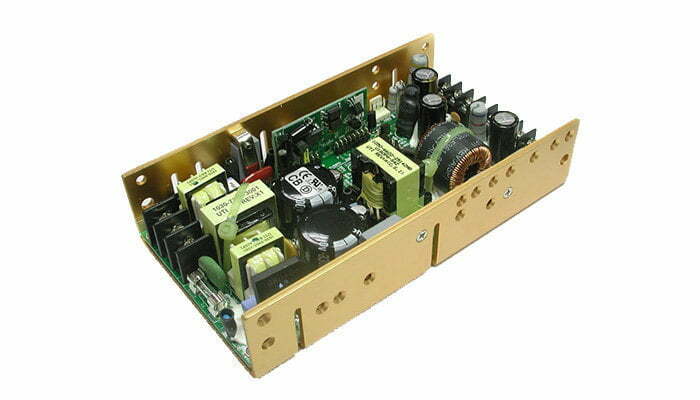 Effectively, EASYMODs® AC/DC switchers allow small program requirements the luxury of costly custom power supply designs. Looking for the DC input version of this product? Click HERE. Looking for the Medical Approved version of this product? Click HERE.